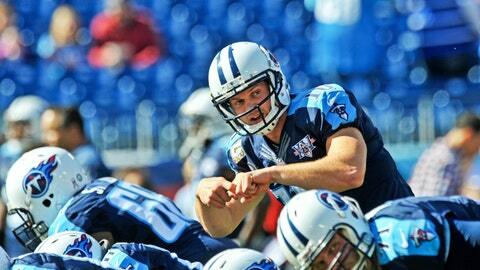 Titans quarterback Jake Locker particpated in individual drills during the team's opening minicamp session on Tuesday. NASHVILLE, Tenn. — Finally, new Titans coach Ken Whisenhunt got to see today what his team is all about on the practice field. Granted, the players can’t don equipment other than a helmet for the three-day minicamp that runs through Thursday, but Whisenhunt could sense the team is making progress in grasping a myriad of changes, both offensively and defensively. "The thing that was impressive to me, that stood out to me today more than just physical play, was the leadership of some of our veteran players," Whisenhunt said after putting his team through its paces for the first time. "Just from hearing their conversations, it’s obvious that they’ve put the time in studying offensively and defensively, talking about the individual plays or the schemes. That communication is a big piece of what we are trying to be as a team, so that was great to see." All 68 players listed on the active roster showed for Tuesday’s voluntary minicamp. The players had last week off after participating in the team’s two-week offseason conditioning program that included classroom work, both collectively as a team and individually in player position groups. But Tuesday marked the first day coaches and players alike could come together on the practice field and start working on what they’ve been studying and talking about over the past several weeks. "One thing I said is, ‘You’re not going to make the team today or in this minicamp. This is really more about finding out about what you can do,’" Whisenhunt said. "But let me stress the point we made about competition. Competition is an important piece to this. You find out about your players and how they handle situations when they are competitive. So, the competition aspect of it is invaluable for us." Quarterback Jake Locker participated in individual drills and remains limited while still recovering from foot surgery last November. Veteran Charlie Whitehurst and second-year Tyler Wilson are slated as his backup quarterbacks. "I think we knew that is what he was going to be able to do," Whisenhunt said of Locker, who missed the last seven games of last season with the foot injury and nine overall. Any reps that we can get him, anything that he can do out there on the field, is something we want to do. We just have to make sure we don’t too much." Locker said after today’s practice that the rehabilitation process is ahead of schedule and he hopes to be ready to participate in organized team activities and minicamps in May and June. "You have to understand where you can push yourself to get better and come back before people expect you to," Locker said, "but also at the same time be smart and not set yourself back. … This is the first time I got to be under center in a long time, so I was excited." While studying the play book is important, Locker said the best way to learn a new offense is be on the field and watch the plays unfold. "A lot more so now," Locker said of grasping the offense, "especially that we are calling full plays, calling plays in the huddle, executing an offense that we will be executing this fall. It’s really coming together and starting to make more sense when you put everything together, protection, route schemes, all those things coming together as one." Changes are also afoot on defense, where the Titans are moving from a basic 4-3 alignment to what Whisenhunt and defensive coordinator Ray Horton are calling a "3-4 hybrid" set. Several defensive linemen and linebackers are being asked to play new positions. That includes veterans Derrick Morgan and Kamerion Wimbley, defensive ends in the former 4-3 set, being asked to play more as outside linebackers. It also means linebackers are being asked to do more defending in space on pass routes and/or rushing the quarterback. "We’ve got a lot of different guys playing different spots," said Whisenhunt, the former Chargers offensive coordinator and Cardinals head coach who took over for Mike Munchak. "We’re trying to get a feel for what some guys do better than other guys. But it’s really about getting lined up, adjusting to motions, adjusting to formations, communicating. Those are the things where you really get a sense for what these guys can do." Following each day’s practice session, Whisenhunt and staff review film from earlier in the day. The team then goes through a walkthrough later in the day. That left Whisenhunt hesitant to proclaim the first practice — and any others, for that matter — a success just after it is completed. "You never know from out here on the field," Whisenhunt said. "A lot of times you think it is a bad practice, and it is better when you go in and watch it. A lot of times when you think it’s great, it’s not so good. The one thing we’ve got is we get a chance to watch these guys doing some of the things that we’re trying to get done. It’s a great evaluation tool."